I’ve had a 15mm WWII force of WWII German Grenadiers for many years and to support them I’ve got Stugs and Panzer IVs. I almost always collect the most common troop types for any nation I play before moving on to more exotic stuff. Well taking part in the Chain of Command playtest has given me the opportunity to do some more Germans, so I’ve started on some armoured cars. First up an SdKfz 234/2 Puma from Battlefront. It’s not often that Battlefront/Flames of War provide the cheap option for anything, but in this case they do. 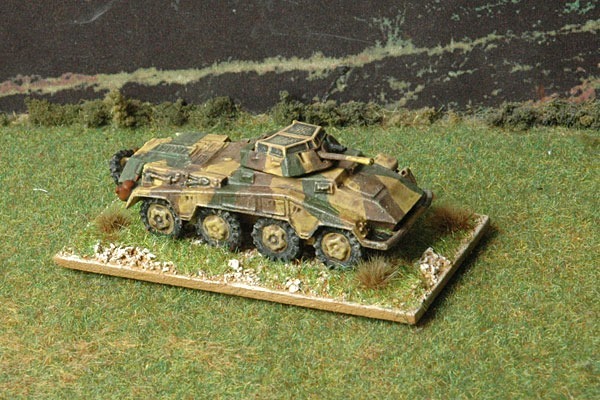 The Puma model come with two turrets allowing the same model to be used as an SdKfz 234/1. Two for the price of one. It’s not got markings yet, I’ll be getting some transfers from Dom’s Decals this weekend. 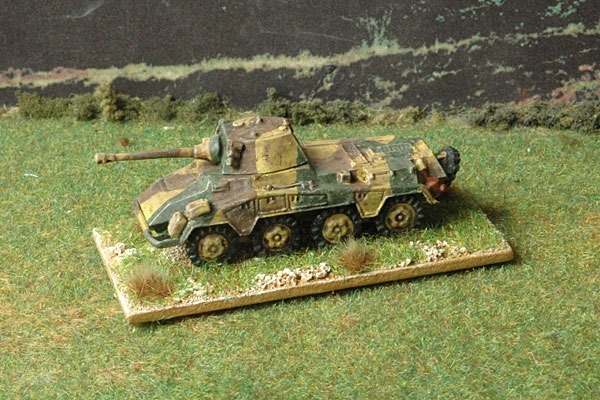 But if you want really inexpensive it’s hard to beat Zvezda, here’s one of their SdKfz 222s. I’m not very happy with that model. I had to give it a second coat of paint after using an unsatisfactory Dunkelgelb the first time round. Now I need to get some Panzergrenadiers and half-tracks to go with the Armoured Cars. 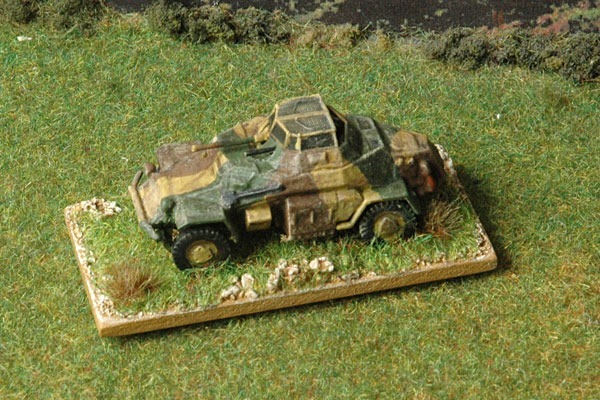 Peter Pigs late war Germans in zeltbahn should do the trick, mounted in Plastic Soldier Company SdKfz 251s. Peter Pig do unit packs boxes and I’ll be able to get a starter force containing a full platoon of 35 Panzergrenadiers for CoC for the princely sum of £12. That’s why I’m doing the game in 15mm. But all that’s going to have to wait until I’ve finished the stuff that’s on the painting table – reinforcements for my British and German Grenadier Platoons and a complete Platoon of British Paratroops. If you want to find out what Chain of Command is all about you should take a look at the videos on the TooFatLardies YouTube Channel, and then this blog post from Lard Island news in which they talk through the course of a game. I must say it’s one of the most enjoyable games I’ve played in a while and it seems to reward historical tactics.